From its mineral qualities, mica has a natural structural stability, which means in it is frequently the perfect manufacturing solution when it comes to electrical components and other essential processing parts. These include marker dials for navigation compasses, thermal regulators, heater elements, wave plates and optical filters. As a dielectric, mica retains its stability under intense heat, and it combines this with low leakage and high insular strength. Elmelin provides mica components to order, providing essential support to the power electronics and other industries. Transistor parts – these require effective heat insulation to ensure consistent performance. Mica washers ensure heat dissipation. Heating elements – for electrical insulation, mica is used extensively and is found in toasters, kettles, hair dryers and other domestic electrical appliances. Cut mica discs – these shapes are used in a variety of devices and appliances, including communication devices and breathing apparatus. This is just a snapshot of the many mica components Elmelin fabricates to order. We also hold components in stock, so, if suitable, customers can order off the shelf. For other essential components, mica is the perfect, safe successor or substitute manufacturing material. With no deterioration at high temperatures, and being non-combustible, phlogopite mica gaskets have cross-industry recognition for their heat resistance and functionality. They are also strength, with a formidable compressive durability. Mica gaskets can be found in turbo chargers, turbines, and exhausts, and are suitable for a range of applications in hot, dry gaseous environments. They have heat resistance in continuous temperatures of up to 800°C approximately, but can offer resistance in the shorter term for as much as 900°C. Elmelin manufactures mica gaskets to order. Want to find out more about mica components? Elmelin’s mica washers have robust thermal and electrical qualities, making them ideal as insulators. They are both heat and corrosion resistant and can be used in many different electrical and industrial applications where thermal and electrical conductivity and insulation are key issues. 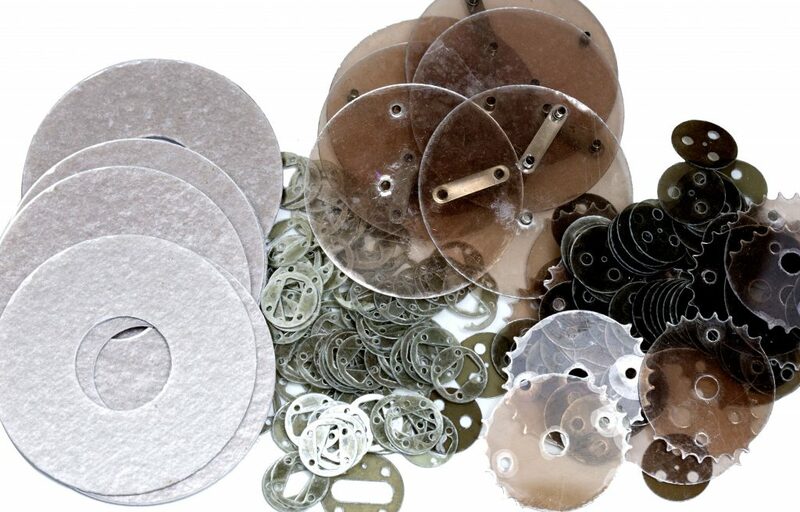 We supply mica washers in a range of sizes and can manufacture them to our customers’ specifications. Mica’s sheer versatility makes it ideal for producing specialist components to aid manufacturing processes and solutions.